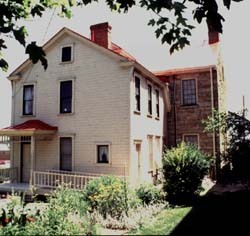 The LeMoyne House, a National Historic Landmark, was built in 1812, and was a center of antislavery activity in southwestern Pennsylvania from the 1830s through the end of slavery. Dr. F. Julius LeMoyne (1798-1879), the son of a Parisian doctor who immigrated to the United States, was born in Washington and studied medicine at the Jefferson Medical College in Philadelphia. 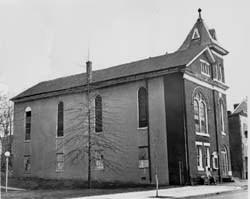 In 1834, LeMoyne joined the Washington Anti-Slavery Society and was the organization's president from 1835 to 1837, after which he was commissioned by the American Anti-Slavery Society to be its regional agent. LeMoyne, along with his children and wife Madelaine, were active in the Underground Railroad. The tightly knit free black communities in southwest Pennsylvania helped slaves escape and developed an operational network that white antislavery activists, such as LeMoyne, joined. LeMoyne's correspondence from the 1840s includes letters from individuals asking for aid and thanking him for his assistance in getting them and their friends and relatives out of the South. In his activism and philosophy, LeMoyne represents the mainstream of antislavery activity in the United States before 1850 and is typical of the middle-class Americans of the antebellum period who became caught up in the antislavery debate. 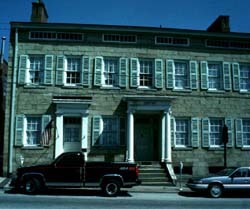 The F. Julius LeMoyne House is located in Washington, Pennsylvania at 49 East Maiden Street. It is open to the public for guided tours Tuesday-Friday, 11:00am to 4:00pm. For groups tours of 20 or more, please call to make an appointment. Call 724-225-6740 for further information, or visit the house's website.